Begin with a brainstorm. Come up with ten or so keywords that are loosely related and then identify niche phrases related to those keywords. Copy these keywords into Google Keyword Planner to get a detailed analysis of search volume, level of competition and suggested bid price. Study your analytics to identify the keywords people are already using to find your website. Visit online forums, quora and sub-reddits to determine the exact terminology people are using when they search. Use Google Webmaster Tools to see which keywords people are using where your website shows up in the results. Check Yahoo Answers for the questions that are most commonly asked. When you first start learning about inbound marketing, it's easy to feel bombarded by all of the different tactics that experts discuss. Keyword research is a classic example of something that you probably already know you should be doing, but aren't quite sure how to do it. Keywords are the terms that people type into search engines. They can be one word or they can be phrases of several words. Regardless of their length, targeting keywords in your content is one of the fundamental elements of SEO and it is an easy way of tracking the progress of your SEO efforts. Your ideal persona is online searching for what you provide, but how can you ensure that they find you? By identifying the exact keyword phrases they are using and creating useful content that targets those exact phrases. Will people find your website if you never do any keyword research and just create content that you feel is relevant? Eh, eventually maybe they will -- but doing keyword research will speed up that process dramatically. Before getting started with keyword research, you should have created buyer personas for your brand. Once you have a clearly defined buyer persona it will be much easier to identify keywords and conduct advanced research into their search habits online. Begin with some brainstorming. For example. let's say your ideal persona is a blogger. Come up with ten or so keywords that are loosely related to blogging and write them all down. Each of these phrases will act as a topic for a group of additional keywords. Once you've got several topics to work with, you want to identify niche phrases related to those keywords. An easy way to do this is to type the keyword into Google and look at the suggested search queries. Write down the relevant searches and ignore the ones that don't fit. Once you hit enter and complete the search, you can scroll down to the bottom of the page and Google will have a list of "related searches" which also provides additional keywords for you to use. At this point you should have around three to ten keyword phrases surrounding each topic. Now you can go and copy all of these keywords in the Google Keyword Planner to get a detailed analysis of each one, including search volume, level of competition, suggested bid price, etc. This will help you decide which keywords to create content around and which keywords aren't worth the effort. Where else can I find keywords? There are several ways to identify keywords that your persona uses. If you already receive a decent amount of organic traffic, you can study your analytics and identify what keywords people are already using to find your website. This is how you can figure out if your current visitors are being under-served. For example, let's say you have a post titled "7 Ways to Improve Web Design Without Coding" and you notice that people are landing on this page after searching the phrase "wordpress templates that don't require coding" or something similar. Sometimes people end up landing on a page where you inadvertently use long tail keywords in the content that aren't necessarily the focus of that content. This is a good problem to have, because it gives you ideas to build additional content around. Another effective strategy is to go where your persona hangs out online and analyze the exact language they are using. These can be niche forums, quora, or sub-reddits related to your industry. From within the forum, search your keywords and find the posts that have the highest engagement. Not only can you find out what your persona cares about the most, but you can learn the exact terminology they use to describe their problems. These are words they are more likely to enter into a search engine when looking for a solution. This is valuable information that your competitors likely aren't taking the time to identify! Now you know how to identify keywords and where to find them. The next step is to understand the different types of keywords, so you know how to use them correctly. 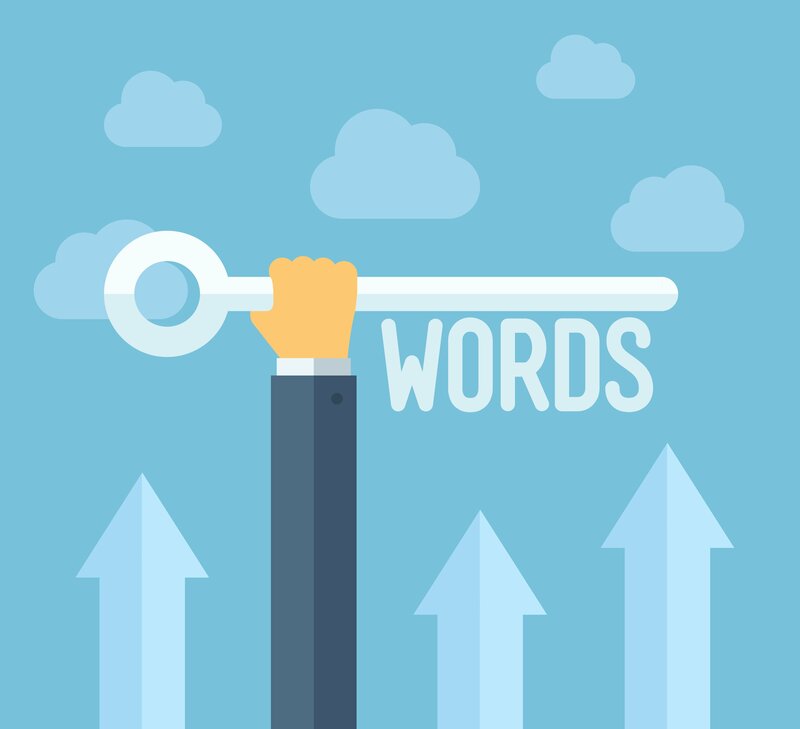 Keywords are generally broken down into three categories: head keywords, body keywords, and long-tail keywords. Head keywords -These are typically one-word keywords that have the highest amount of search volume and the highest competition. Examples include: blogging or advertising. These keywords are too general and are the most difficult to convert because predicting the intention of the persona searching head keywords is virtually impossible. Someone searching for an advertising company to promote their brand is completely different than someone searching for an advertising job. Head keywords generally describe an entire industry. Body keywords - These are usually two to three word phrases that are more specific than head keywords and still generating a decent amount of search volume. Examples would be: PPC advertising, direct mail advertising, etc. Even though the search volume won't be as high as head keywords, body keywords are usually very competitive still. These are the keywords that define a broad niche in your industry. Long-Tail keywords - Long-tail keywords are very specific phrases of four words or more. Examples include: PPC advertising for IT companies, direct mail advertising for plumbing service, etc. Each individual long tail keyword will generally have a low search volume, but long tail keywords as a whole account for the majority of web traffic. Long tail keywords very specific niches or topics. Your focus should be on targeting body and long-tail keywords. Head keywords are too competitive and don't convert well. Unless your brand or website is big enough to compete with Wikipedia, you're wasting your energy targeting head keywords. A lot of SEO experts will advise you to focus primarily on long-tail keywords, because they convert the highest. However, this generally works best for companies that offer something hyper-specific. Most companies will find that they get the best results by focusing content primarily on body keywords and adding in sections within the content that target long tail keywords. For years, Google Keyword Planner has been the go-to keyword research tool for internet marketers. Since the majority of web searches go through Google, it makes sense to get your keyword research straight from the source. However, there are several other useful tools that could come in handy for you as well. Wikipedia ranks in the top three for virtually every head and body keyword, so getting a peek into their analytics provides valuable data that you can use for your own content. Stats.Grok.se is a little-known resource that allows you to see how many views a particular Wikipedia article is getting per day. You simply type in the keyword for the article you want to research in the search bar, hit "Go" and you'll be directed to a graph displaying the results. If you use Google Webmaster Tools (signing up is free) there is a very useful section in the console that allows you to see which keywords people are using where your website shows up in the results. This doesn't necessarily mean that people are clicking your link, it just means that you are near the top of their search results. This is valuable information, because rather than creating content from scratch to target keywords you can fine-tune the on-page SEO to rank higher for keywords you are already ranking for. Google Trends is a great tool for finding keywords that are popular right now. If your business likes to keep your customers updated on all the latest news and events, this is a must-have tool to use. A large chunk of search queries made online are in the form of a question. Yahoo! Answers is a useful resource for finding the questions that are asked most commonly and for seeing exactly how these questions are worded. A long-time favorite among inbound marketers, Market Samurai is a paid tool that's similar to Google Keyword Planner -- but with a lot more advanced features. An alternative to Market Samurai is another paid tool that might have passed Market Samurai in popularity -- Long Tail Pro. This tool is exactly what it sounds like, a keyword planner that helps you identify valuable long tail keywords.